How Do You Make 9 Million People Invisible? If you’re reading this site, you’re probably a bit cynical when it comes to government reports, or at the very least, you are a realist and expect some shenanigans may be distorting the truth. That is the argument we’ve attempted to make several times, that through questionable reporting tactics, the US government has continued to hide unpleasant economic realities like high inflation, high unemployment and a stagnant economy that plods along on high levels of deficit spending. The unemployment rate is one area that everyone, even those in the otherwise uninformed general public, recognize as the defining feature of economic health. Of course, as Daniel R. Amerman notes, it’s all a lie or at the very least, a confusing mess. “The government’s own data base shows that about 9 million people without jobs have been removed from the labor force simply by the government defining them as not being in the labor force anymore. 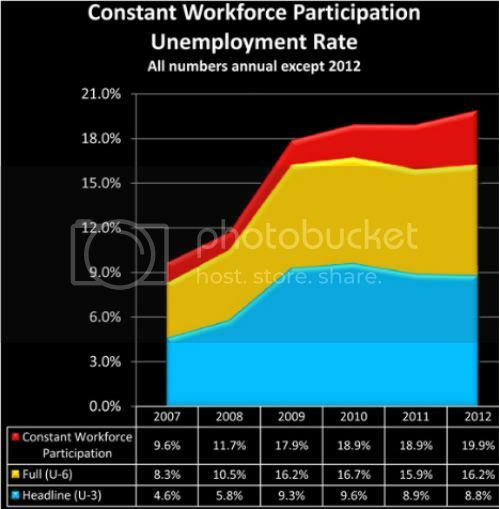 Indeed – effectively all of the decreases in unemployment rate percentages since 2009 have come not from new jobs, but through reducing the workforce participation rate so that millions of jobless people are removed from the labor force by definition. The common defense of this is that many of these people are retiring Baby Boomers. We’ve disputed this, but finally Amerman has some numbers to back up this supposition. The chief argument against Amerman’s point is that it is inappropriate to suggest that the labor force should remain constant. This is true to and 9 million is almost certainly an exaggeration, but there are significant numbers of people uncounted by official reports who want to work, but can’t. There are all sorts of possible ways people, especially young people, can be left out of government surveys. This is in keeping with his view that the young are absorbing the brunt of the mismeasurement. UPDATE: According to the Bureau of Labor Statistics’s own projections, the labor force participation rate has fallen far faster than it should have due to simple demographics. 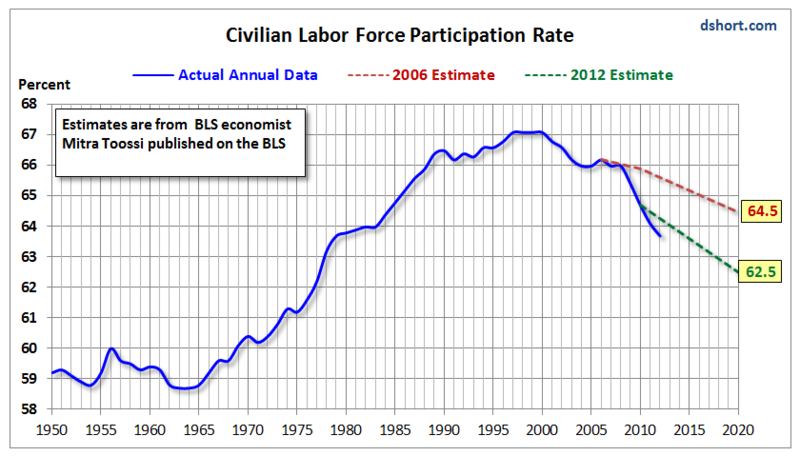 According to this chart, courtesy of analysts Doug Short and Mish Shedlock, the BLS has continued to underestimate the drop in labor force participation, indicating that the drop is more than a shift in demographics. This entry was posted in Opinion and tagged Financial Crisis, Unemployment. Bookmark the permalink. Post a comment or leave a trackback: Trackback URL.